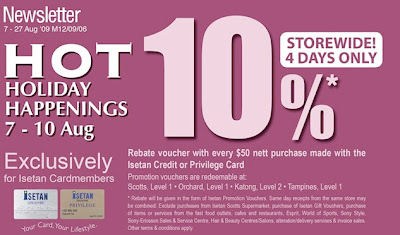 Isetan is having another sale from 7-10 August during which Isetan cardmembers can get a 10% rebate voucher for every $50 spent. 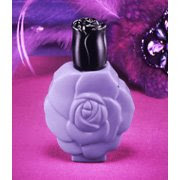 Get more details on the same, including the Lancome GWPs and specials here. Tangs is also giving away $20 vouchers with every $200 purchase on 1-2 August but this is only for Citibank Tangs Platinum cardholders. My Asos.com beauty sale order landed in my mailbox yesterday, barely one week after I placed the order on 21 July! 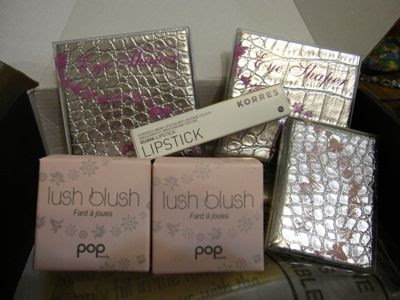 I ordered mostly POP Beauty stuff as some of the palettes were discounted steeply. I managed to check out most of the items at the new Sephora store in ION before ordering them online so I was pretty confident that I would like most of them. 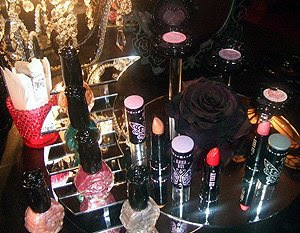 Not to mention, I saved quite a lot compared to if I had purchased them at Sephora! The 6 items I got cost only £28.20, inclusive of the £3.95 shipping fee. 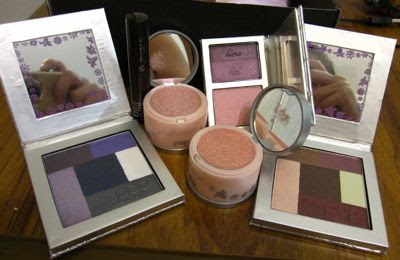 So far, I've only tried the Purple Popper palette and Peach Blossom blush and liked both. 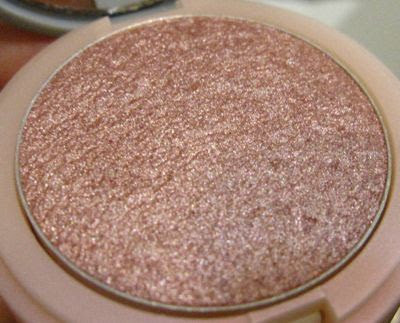 The Peach Blossom gives a lovely peachy pink pop of color with a fine shimmer. 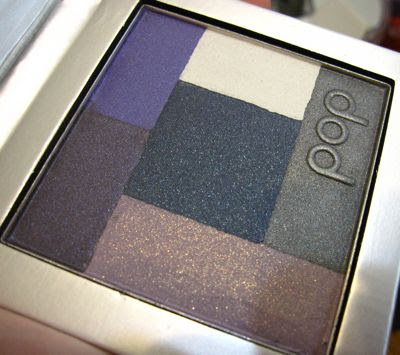 The shades in the Purple Popper palette were silky, pigmented and complemented one another very well. The Prestige warehouse sale with makeup from Paul & Joe and Givenchy plus loads of perfume brands such as Banana Republic, Versace is taking place from tomorrow Wednesday 29 July to Friday 31 July from 10.30pm to 6.30pm at 6 Jalan Kilang, Dadiani Industrial House (near Bukit Merah). My advice is to go early on the first day as the best bargains usually get snapped up very quickly. Paul & Joe revamps its product lineup, especially foundations, primers, mascaras etc quite frequently so these warehouse sales are where you can pick up recently discontinued plus current products at a good discount. 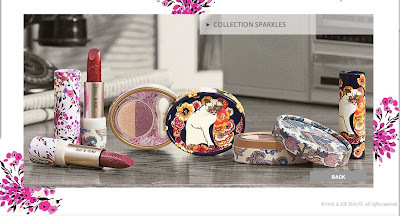 They usually also have leftover stocks of recent limited edition collections. I'll be giving it a miss as I'm saving up my pennies for the P&J fall collection. 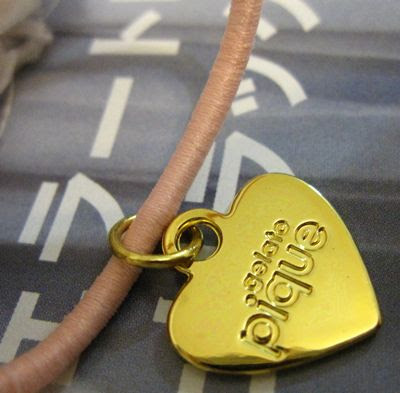 You can read my account of the last Prestige warehouse sale back in November 2008 here! 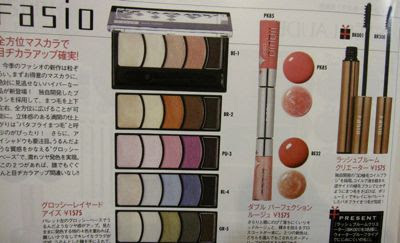 Kinokuniya is now giving away a pack of Fasio Cool Powder sheets with each issue of Chic magazine. Check out kenji_sugizo's blog for more details. 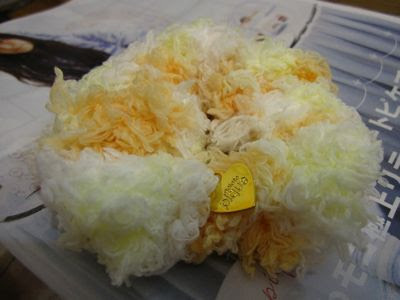 Kino will also be giving away an Original Source shower gel with the next issue, which should be out late next week. The Paul & Joe website has been updated with the new fall collection, "Breathless". 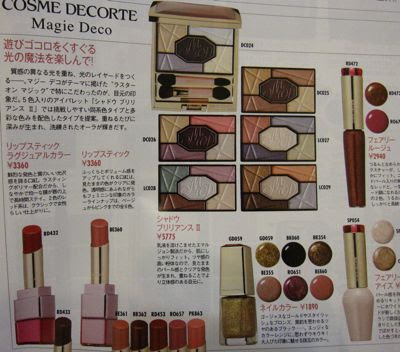 The new eyeshadow duos cost 3150yen in Japan, so I'm expecting them to cost close to S$50 in Singapore, or perhaps even more. 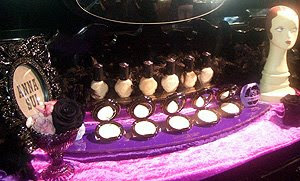 The collection should be launched in Singapore in late August or September. 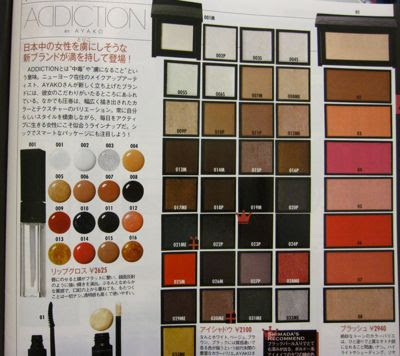 Voce magazine did an in-depth feature on the newly launched Addiction., created by Japanese makeup artist, Ayako who was formerly the international makeup director for NARS. She met Nars in 1995 and he became her mentor for 14 years. It's probably no coincidence that Addiction comes in a sleek black packaging like Nars, but without the horrendous rubber. 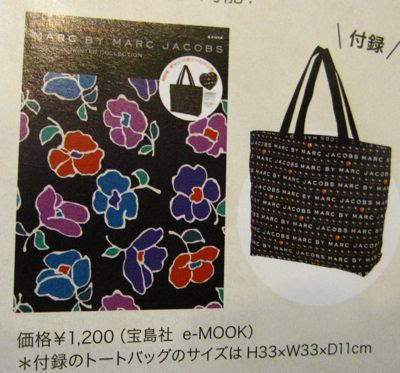 Ayako's philosophy for Addiction was to create a brand that allowed women to express their individuality fully. 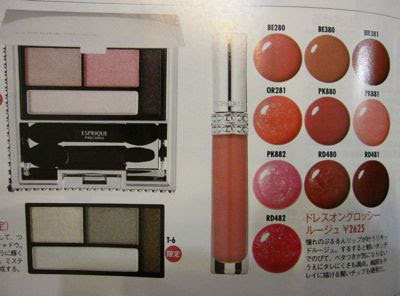 Ayako set out by focusing on the basic shades but in a variety of textures. 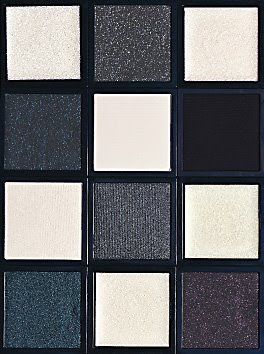 For example, she wanted to create ten black and ten white eyeshadows but in the end, she narrowed it down to six shades each. 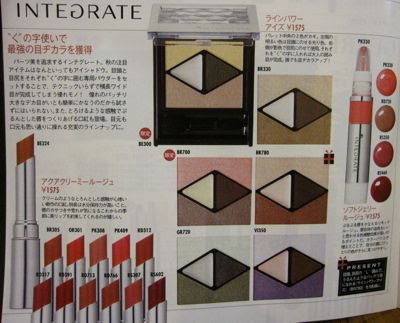 The eyeshadows (2100yen) come in 4 textures: matte, pearl, metallic and sparkle. 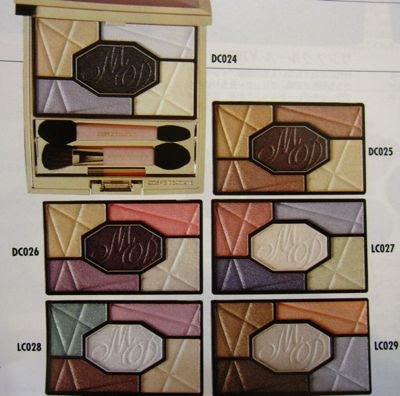 Ayako wanted to create shades that she desired but could not find in other brands. 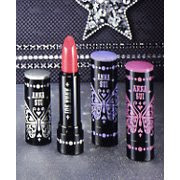 She was also very focused on creating red lipsticks even though the usual thinking among Japan makeup companies is that red does not sell as well as pink. But she managed to win the company over with her passion. Here are two looks that Ayako did on Japanese actress/model Ai Tominaga. For "Black Sensation", Ai is wearing Eyeshadows in Snow Magix, Keshi and Crow, Blush in Roccoco, Nocturne and Sometime, Cinnamon Eyebrow Pencil , Blackjack Mascara, Endlessly Lipstick, Ivory Coast Lipliner Pencil, Tinted Moisturiser #3, Perfect Concealer Covering #1, Natural Veil Powder #1. For "Red Sensation", Ai is wearing Eyeshadwows in Ice Wall, Sandcastles, Rigoletto, Blushes in Rococo, Nocturne and Aqua Bronze, Cinnamon Eyebrow Pencil, Blackjack Eyeliner Pencil, Blackjack Mascara, Femme Fatale Lipstick, Flamenco Lipliner Pencil, Tinter Moisturise #5, Perfect Concealer Pact and Natural Veil Powder #2. Ai Tominaga with Ayako at the launch of Addiction in Isetan department store in Shinjuku, Tokyo. I also picked up the new issue of Voce magazine (S$14) for the fall collections catalog, which comes in a larger size than previous years. Here are some brands that are featured in it. 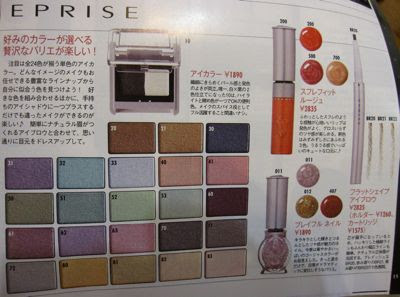 Esprique Precious, which is debuting in Singapore in late August! Esprique Precious/Kose is one of the sponsors of the Cozycot Holy Grail party which is happening at the Singapore Expo Hall 6A on 26-27 September so don't miss it if you're interested in the brand! Just click here to register for the party. I'm not sure what will be available at the party but usually there will be some good deals. Unfortunately, I'll be in Delhi at that time and will have to give it a miss. 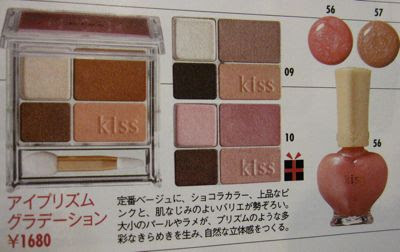 This Face & Blush Duo Palette looks interesting! 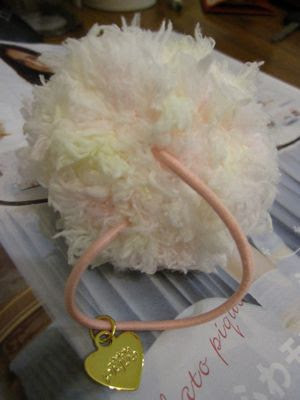 Picked up the September issue of Spring (S$16.40) today, mainly for the two Gelato Pique fluffy hair accessories that came in it :-) The material is incredibly soft and poufy, each with a gold heart-shaped logo charm attached. The magazine was also quite a good read, chock full of summer fashion, makeup and hairstyling tips. 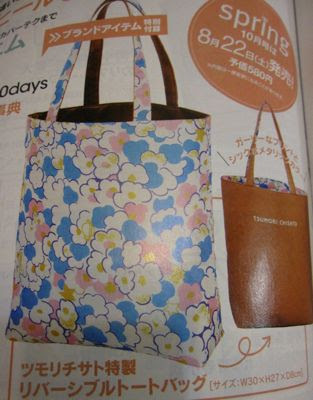 The October issue will include a reversible Tsumori Chisato tote. 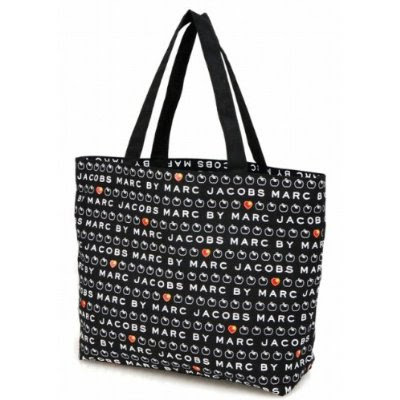 If you're a Marc Jacobs fan, you would not want to miss the Marc by Marc Jacobs mook (1200yen), due out on 4 August, which will come with a tote bag measuring 33x33x11cm. Amazon Japan is taking reservations for this mook and it ships worldwide with shipping fees differing based on location. 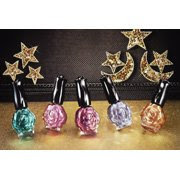 Lunasol has updated its website with the new fall collection. Check out the collection here. 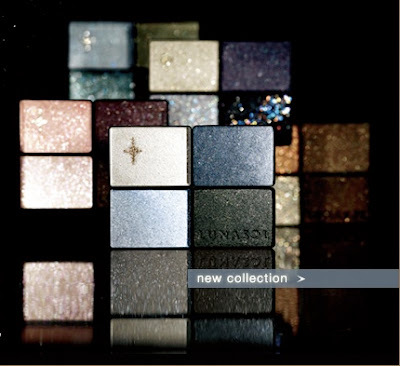 The new Star Shower Eyes palettes look very promising and sparkly in this promo visual, hope it's really that stunning in real life! 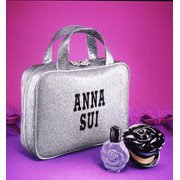 Anna Sui will release its fall makeup collection "Dreamy Doll" including new base makeup items on 20 August in Japan. 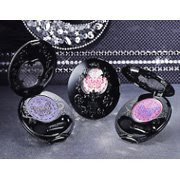 The base makeup products all come in newly designed packaging featuring Anna Sui's signature rose motif. Here are some pics from the press event in Tokyo, from Biteki.com. The September issues of Voce, Biteki and Maquia are published in Japan today and should be arriving at Kinokuniya in Singapore soon. Voce features Maquillage spokesmodel Karina on the cover and comes with a detachable fall collections booklet featuring 57 brands. Check out this page for more snapshots of the features in this issue. 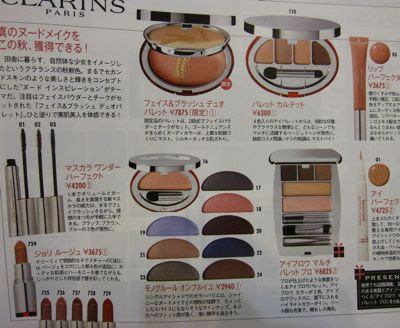 For Paul & Joe fans, the October issue (due out on 22 August in Japan) will include a P&J pouch and base makeup sample! 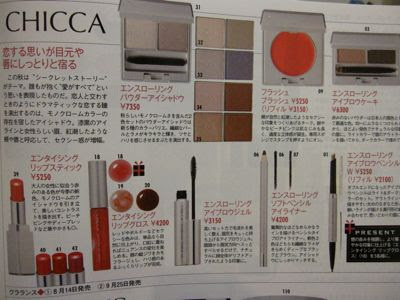 Biteki also comes with a fall collections catalog featuring 57 brands. The cover model is wearing Lunasol Star Shower Eyes #3 Dazzling Night and Star Dust on Eyes EX01, Dior Addict High Color 332, Maquillage Perfect Gloss BE360. 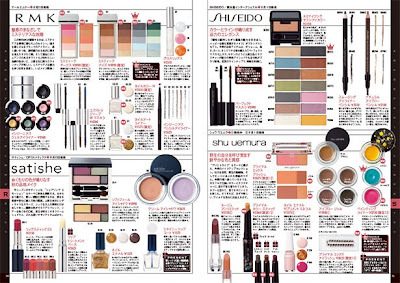 Maquia's fall catalog is smaller with only 48 brands. 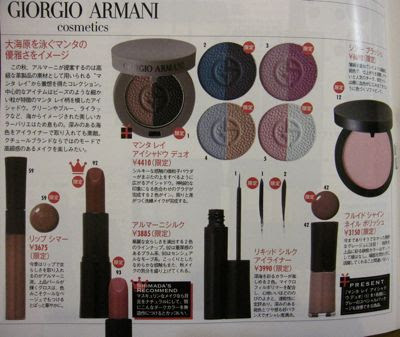 Another Maquillage spokesmodel, Anna Tsuchiya, is on the cover. The September issue can be previewed here. NARS makes some of the best blushes but one big drawback is the black rubber packaging which is not only a dust/loose powder magnet, but also gets horribly sticky in humid/tropical climates. Here in sunny Singapore, my NARS blushes have become a horrible sticky mess that leaves residue on my fingers every time I pick one of them up. I got so fed up with them that I decided to depot them into empty CD cases. 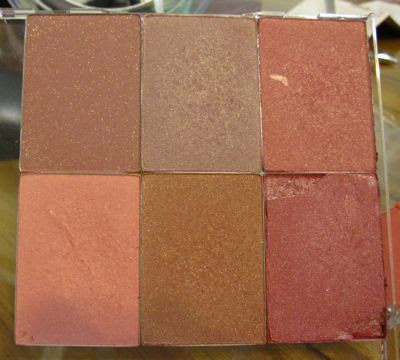 I've had experience with depotting dozens of MAC eyeshadows with the candle method. 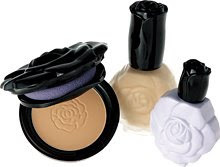 Basically just hold the black plastic insert with the eyeshadow pan over a candle flame and after about 20 seconds, the glue holding the eyeshadow pan becomes soft enough to easily lift the pan out. I did a bit of research on Makeupalley about depotting NARS and the consensus seemed to be that placing the compacts on a flat iron is the easiest method. But as I didn't own a flat iron, I decided to try my luck with the candle method. 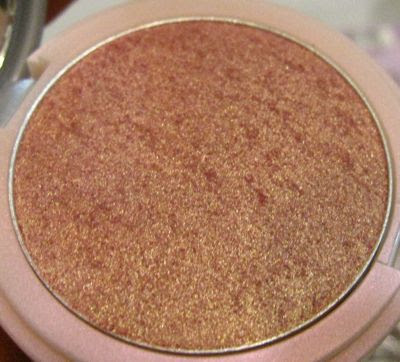 I held the blush compact over the flame for about 30 seconds, and then used a small manicure scissors to pry the black plastic insert (which holds the blush pan) loose from a corner. This is the trickiest part and usually takes the longest time. Once I lift the corner high enough, I insert another manicure tool (with a broader surface) into the opening to lift up the insert. 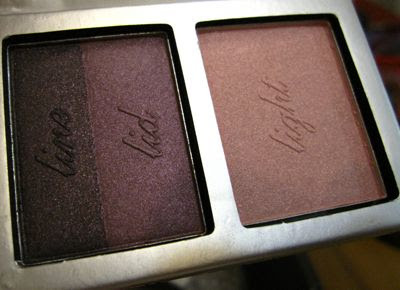 Once the black plastic insert has been removed from the compact, the rest is basically the same as depotting MAC eyeshadows. Hold the insert over a flame for about 30 seconds and the focus the flame along one edge. Then pry the blush pan loose by inserting the manicure tool (like a nail file) between the pan and the edge that has been melted into a soft consistency. 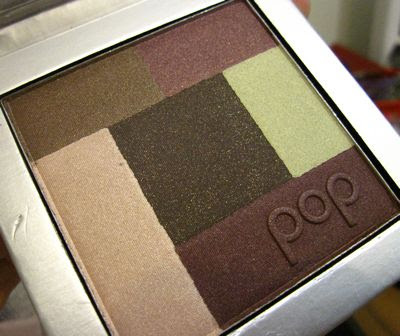 I forgot the golden rule of depotting which is to always start with a shade that you don't mind damaging. Instead of starting with Exhibit A (above, with Taos), I started with Crazed, one of my favourites, and ended up losing a few small chunks of it at the corners as it lifted unevenly from the insert. 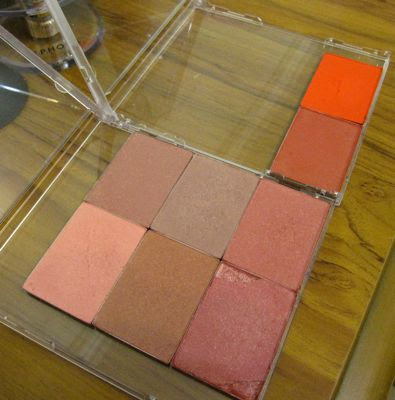 Fortunately, I got much better at it as I went along and by the 8th and final blush, I was depotting each one in less than five minutes without any nicks. It took me another 5 minutes to scrub all the sticky gunk off my fingers. It felt really good to chuck all the rubber compacts into the trash at the end! 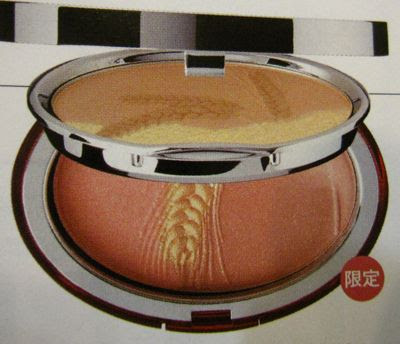 Don't you just hate it when companies spoil great makeup products with lousy packaging? Of course the CD cases are not ideal as well as I can't bring them out but at least I don't get sticky fingers each time I try to pick up one of these. The Majolica Majorca website has been updated with the Fairy Sadistic collection with downloadable screensaver and blog clock. (Note: The website was showing Fairy Sadistic earlier today but it's showing the Innocent Pleasure collection right now. I expect this will be rectified soon.) 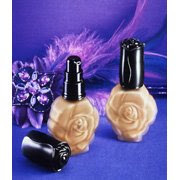 Check out this Iswii post for close-up pics and swatches of the new products. 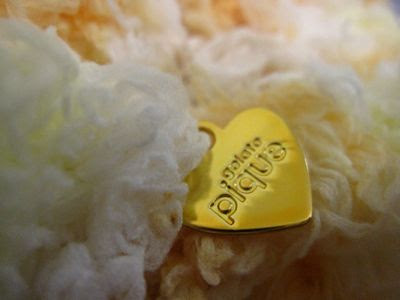 The Kate and Lavshuca websites have also been updated with the fall collections. The Kate website also has the new TV CM and making-of clip featuring Mika Nakashima and the new Reflect Mirror Eyes palettes.